"Do you have rubber chickens with a pulley in the middle?" 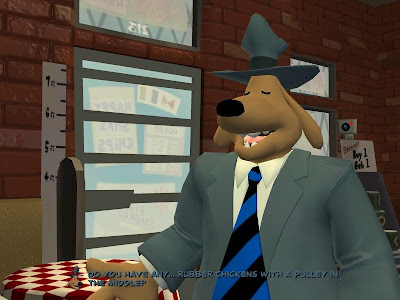 One of the things you can ask Bosco if he has in his store is "rubber chickens with a pulley in the middle". The rubber chicken with a pulley in the middle comes from the Voodoo Lady's shop in The Secret of Monkey Island.